Sweet, garlicky, and slightly spicy Honey Garlic Salmon, quickly marinated in honey and lemon juice, and ready in less than 30 minutes! I don’t write as much about the “crazy” or the “rants” that caused me to name this site Rants From My Crazy Kitchen as I used to, but it’s still here. Even during the process of making this recipe, when I realized I didn’t have any clean tongs, not one pair, much less my fish tongs, after I already had the salmon sizzling on the stove! This lead to me yelling at my husband over his lack of helping around the house, and then neither he or our daughter liked this honey garlic salmon. I did, though, so I wanted to share it with you. Okay, it’s not that he didn’t like it, he just didn’t looked thrilled and I was already in a bad mood over the tongs, and our daughter is stuck on fish baked with butter, lemon, and pepper, She doesn’t like change. I was supposed to take last week off from blogging to watch my daughter’s Godmother’s 19-month-old son while she was in the hospital having her second baby. Then I got a really bad cold thanks to my lovely daughter coughing right in my face (on purpose, repeatedly. Oh, how nice 6-year-old’s are! ), and we decided it would be better if someone else watched him. Since I had the week off anyway, I decided to spend it cleaning the house. Next time I decide to do that, someone remind me to do it on a week where daughter doesn’t miss two days of school with a fever from previously mentioned cold, then a two-hour school delay, then a four-day weekend, finally followed by yet another two-hour delay! My house looks the same as it did before. Maybe worse. Unlike our daughter, I get tired of the same thing, the same way, all the time. I found a Honey Garlic Salmon recipe from Rasa Malaysia that sounded good, with ingredients I had on hand and that we like. I marinated the salmon in the honey and lemon for a short while before cooking. She finished her recipe in the broiler, but after the tong fiasco my salmon was well-done enough and didn’t need it. I think either way you make it would be delicious, so let me know what you try! Sweet, garlicky, and spicy salmon. Quickly marinated then pan seared, dinner is ready in under 30 minutes! Pat the salmon dry with paper towels. In a small bowl combine the honey, lemon juice, water, parsley, salt, cayenne, and pepper; stir well. Place the salmon on a large plate and pour the honey mixture over the salmon. Let it marinate for 10-20 minutes while you mince the garlic and slice the lemon. 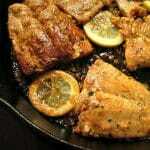 Heat the oil in a cast iron skillet or other non-stick skillet over medium-high heat. 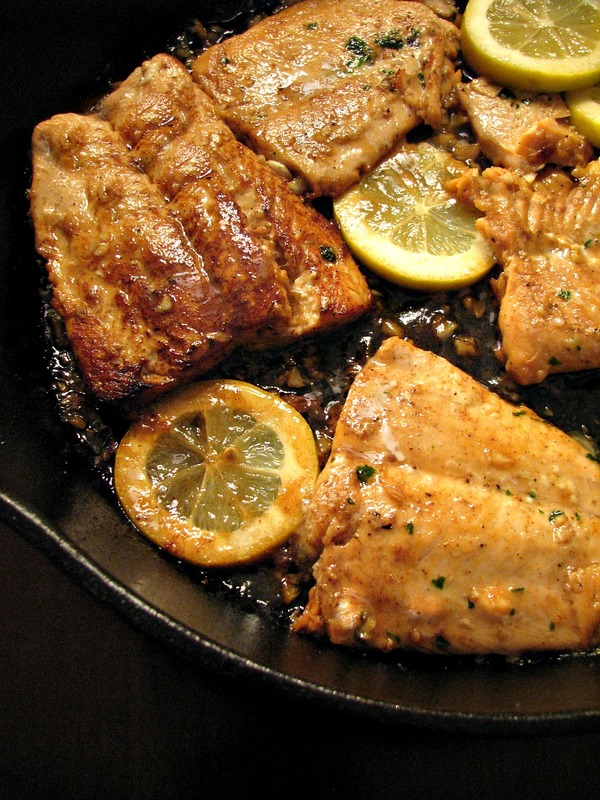 Carefully place the salmon and marinade in the skillet and cook, turning with fish tongs (preferred) once, until cooked through and slightly browned on top, about 5 minutes. Turn the heat down, add the garlic and sliced lemon, and stir the garlic for 1 minute until softened. Salmon is so healthy and this recipe sounds fantastic! Thank you Becca! I’ve been trying to do better with the healthy eating, and this one was a winner for all of us! Did you take the skin off or did you keep it on during cooking? I left the skin on, I love crispy salmon skin. My husband is on a diet so he didn’t eat the skin. Can I use power garlic instead of minced?? Hi Marianne, sure! I would recommend adding 1/2 teaspoon garlic powder to the marinade instead of adding it at the end. Please let me know how it comes out. Do you remove the salmon and then add garlic & lemon? Or add while salmon is cooking? 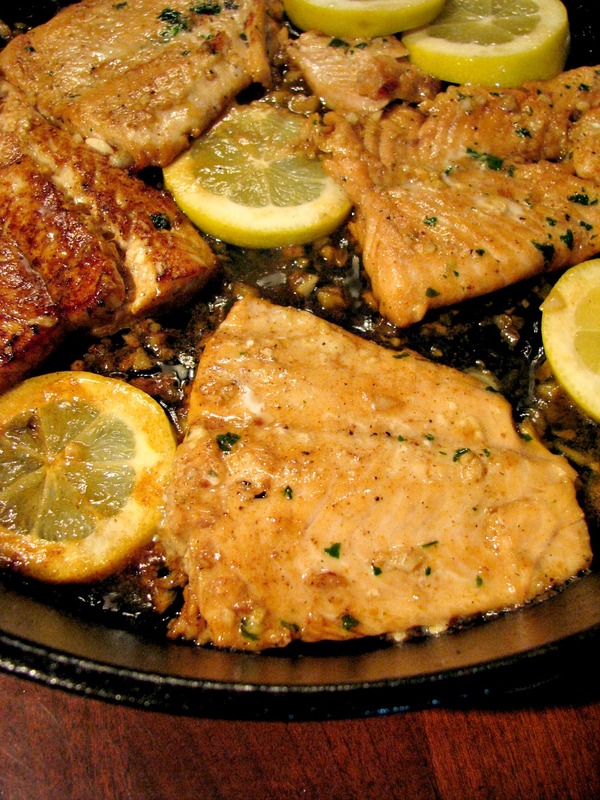 Hi Carol, I turned the heat down when the salmon was cooked then added the lemon and garlic to the pan in open spaces. You can leave the salmon in the pan as long as you have enough room in the pan.